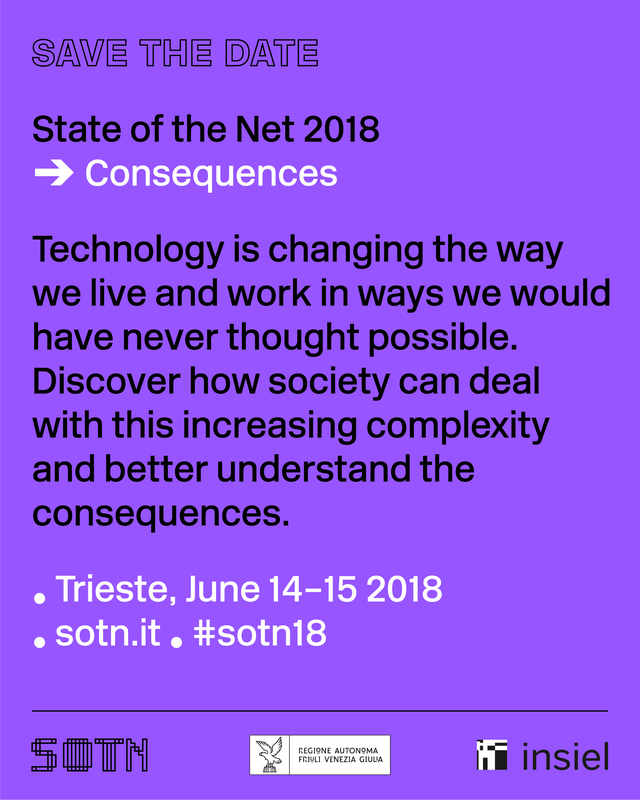 We are happy to announce that State of the Net will be held again in 2018 in Trieste, on June 14th and 15th. The keyword for our keynotes and conversations this year will be consequences. Consequences on society: how things are usually more complex than they seem (think about these days news about Facebook and Cambridge Analytica), how everything will move forward regardless, how citizens and organisations need to be aware of the consequences of their choices. Consequences on infrastructure: from transportation to logistics to healthcare to data management, along with new and exciting capabilities, technology is introducing a number of new challenges. Consequences on business: starting, growing and running businesses is becoming increasingly more demanding, companies are using new tools not only to design their products, but to design their own future businesses. Consequences on culture: a mainstream media diet is changing the way we approach and consume books, movies, TV and news, often with unforeseen consequences. You can register free now, we look forward to seeing you in Trieste next June.